The amazing Harry Soo, one of the modern era’s great pitmasters makes the point in one of his many youtube videos, that barbecue is “about the pitmaster and not the pit.” In other words if you know your pit and you master the discipline your equipment imposes on you, then you have a better than even chance of turning out some mighty fine Q, regardless of what you are cooking on. It’s easy to get caught up in the gear world. I used to obsess over pit design and I still spend a lot of time examining various pits, concepts for pit, websites for pits…and the beat goes on. But what I have learned over the years comports very much with Harry’s quote above. Lately I’ve enjoyed making some tweaks to the set up of my 26 year old Hasty Bake. 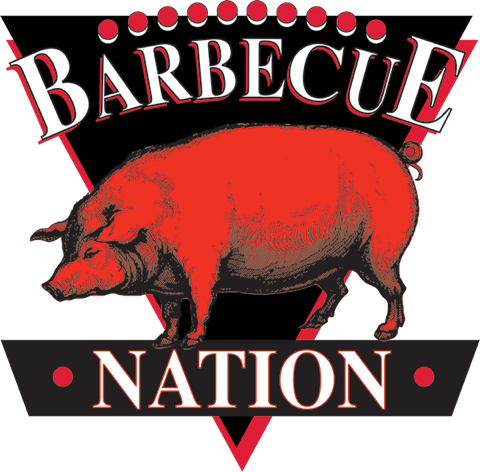 The idea is to make adjustments that will allow me cook with as close an approximation to an offset smoker as I can within the constraints of the Legacy unit which I have cooked on so long that it’s like a member of the family. So: First order of business was to develop the “faux offset fire box.” I lowered the ash catcher to the bottom of the unit, then put two vertical firebricks in so the charcoal tray could rest on it. Then I dropped the charcoal tray down and stacked more fire brick to make the offset firebox. Using the heat shield that comes with the unit for the top of the “faux fire box” completed the set up. Fair disclosure: I’ve been using variations on this theme for years, but of late and for no known reason, it has become an obsession to make it as effective as possible. Maybe that’s where I’m channeling the Zen of Harry. In any event, it’s been a great experiment and I think it’s working well. Next order of business, the Test Fire. Objective: Get a handle on the charcoal quantities needed to get the pit to the desired temperature, and measure the intervals at which additions of coal and wood (apple and hickory for pork, oak and/or pecan for beef; my two cents here, worth what you paid for it.) This went on for many hours. SO NOW COMES THE COOK! To complicate and/or make it all the more interesting, I decided to do a very subtle taste test. One rack – the smaller of the two pictured – is Compart Duroc; and the other Berkshire. What I want to get a handle on here is the relative value of Compart Duroc (retails in San Antonio for about $14/pound. That was $44 for ONE RACK! IF I’m doing this again, I’m ordering direct, online), to Berkshire fromWiatrek’s Meat Market at about $10 for a rack. Still pricey, but hey…it’s R&D and that makes it okay! THE VERDICT: Both the Compart Duroc and Berkshire are top shelf. That said, the vote of the tasters favored the Compart Duroc. It was felt that the CDs were more flavorful and more tender. I hated to agree with this judgement because I had hopes that the less expensive pork would prevail. Alas, it was not to be. The Compart Duroc has a sweet, rich character that cannot be denied. 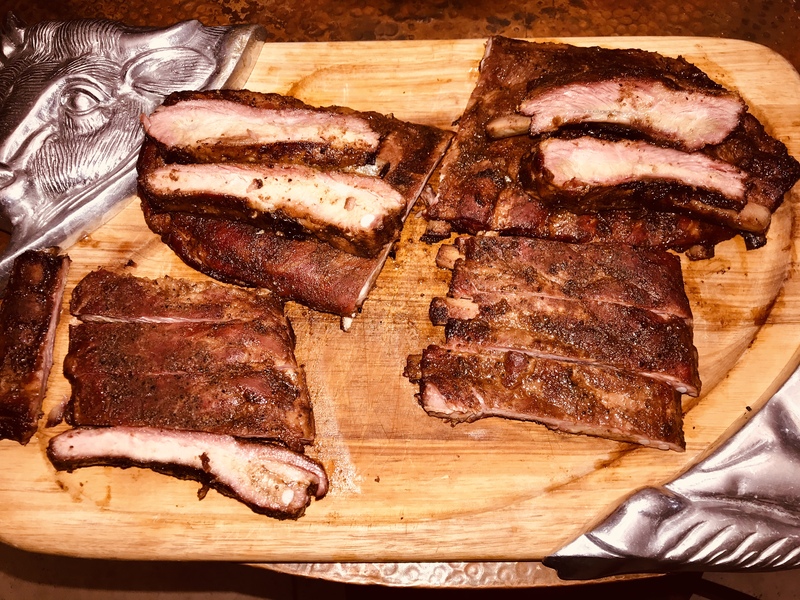 In conclusion, while I make no claim to being a pitmaster, I hopefully took some small steps in that direction with this and some other of my recent cooks. The mastery of the above described set up will take a bit of time and no doubt a bunch of blogposts, and I look forward to reporting back to y’all on what brings in the way of experience and enlightenment as it pertains to the Zen of the ‘Que. All in all it was a great couple of days of experiment, learning, cooking and eating! No doubt there will be a rematch in the not too distant future. A hearty shout out to Harry Soo for the inspiration to dig into this. In the meantime: All the best to all y’all.